IVEK is pleased to introduce the new Megaspense®, our largest displacement pump offering. 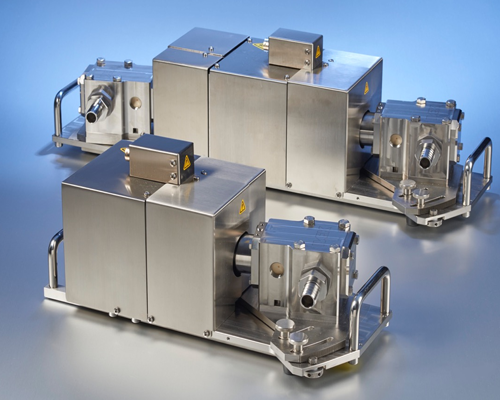 The Megaspense® pump module is unique among positive displacement rotary and reciprocating piston pumps. It is designed to allow disassembly of all the pump module components and/or the removal and return of the entire pump module from the motor/base group without recalibration. The break down of all the wetted components enhances cleaning and the module can be autoclaved. All aspects of a ‘user friendly’ design and customer suggestions were considered during the pump module’s development in order to allow fluid to flow freely, unobstructed through the wetted components without exposure to dead volume areas such as cracks, crevices, or threads. This heavy-duty pump module is extremely durable and stable, and will maintain calibration and accuracy during even the most difficult applications. IVEK’s ceramic piston/cylinder modules are extremely hard and resist abrasion, resulting in a system that exhibits little to no wear even after hundreds of millions of cycles. In addition, the ceramics are compatible with most acids and bases. The natural crystalline structure of the ceramics displays zero porosity, which insures zero retention and carry-over of one biological fluid to the next.